Already have a Rewards account? Click Here to check your current points balance. You’ve asked for it and we delivered. 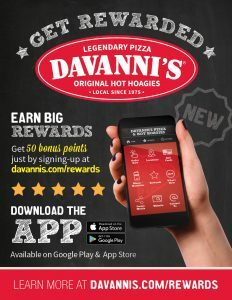 Davanni’s now has a Rewards Program! For the first time ever, you can get rewarded for your purchases at Davanni’s. It’s simple, just sign-up here and you’ll start accumulating points that can be used towards discounts! Oh and the best part is we now have a Davanni’s App! Download it now on Google Play or the App Store! Also, once you fill out the form below, it’ll automatically link to your Insider email account too! Don’t have one? Make sure to keep selected “Yes” for “Can we send you occasional announcements?” for news and additional offerings. Disclaimers: No points are earned on tax, delivery charges, alcohol items, purchases of gift cards, or tip amounts. Points don’t expire, but once you hit the max of 500 points you will go back to 0 to cycle through the program again. Awarded Rewards coupons are stackable if they’re redeemed before their expiration date. Rewards coupons are one-time-use. If the order total is less than the value of the coupon, any remaining balance is not retained or transferred. Maximum of 200 points earned per order. Davanni’s reserves the right to alter or discontinue the Davanni’s Rewards program at any time. Enter your email address below and click submit to check your current Davanni's Rewards points.